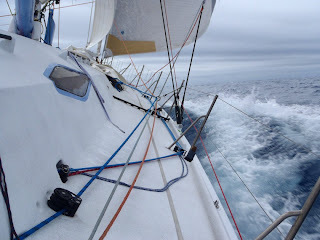 The journey is the second leg of the Velux 5 Oceans yacht race which is a solo race around the world stopping in five ports - an American won the first part of the race last month. This stretch, which was supposed to start yesterday but is delayed due to the horrific storm, takes them 7000 miles from Cape Town South Africa to Wellington, New Zealand. Their friends and family will see them off knowing they might never see them again, as this leg takes them through waters where they routinely encounter 40 foot waves and hurricane force winds. During the majority of the voyage, if something goes wrong, rescue from outside sources will be almost impossible so the sailors may have to rescue each other - this has happened in the past. They will sleep a maximum of 45 minutes in a stretch and eat 7000 calories of freeze dried food a day all while living inside a space no larger than a closet and being thrown off of waves constantly. They haven’t forgotten about Christmas… the sailors will celebrate the holiday by opening cards and a few small presents that their shore crews stashed aboard before the start. If conditions allow they will make a satellite phone call home to their families to wish them a Merry Christmas. Chances are the sailors won’t even celebrate the New Year’s holiday. The lead sailors will finish the leg in approximately one month; the trailing boats could take over 6 weeks to finish the leg. Once ashore a real meal and time with their families awaits the sailors, then it’s time to prepare for the next leg. Stay tuned to the Daily Boater for more Velux 5 Oceans news. The official Velux 5 Oceans site has another look at how the sailors in the race are getting through the holidays. It's worth checking out, as they obviously have much more insight into each competitor's family life and their plans for Christmas.